Here's one of the easiest ways you can save money and water: learn how to manage your irrigation controller. AMWUA cities' conservation professionals continue to report that many homeowners, businesses and HOAs irrigate their landscapes throughout the winter as if it were still 110 degrees outside. It's such a waste because most desert-adapted plants can make it through the winter months with little or no water. Even rye grass can thrive with a watering only every week or two. Water efficiency professionals at AMWUA member cities offer ten important things to know about winter watering. 1.) A "sewer fee" is part of the water bill you receive each month from your city. Most cities recalculate this sewer fee each year based on a homeowner’s average water use during winter months. You can lower next year’s monthly sewer fee by cutting back on the amount of water you use this winter. 2.) Overwatering can kill your desert-adapted plants. The roots need the soil to dry out between waterings so they can absorb nutrients from the soil. Soggy soil prevents plants from pulling in essential elements, such as nitrogen and iron, and can suffocate the roots. This leads to yellowing leaves, poor health and even death. 3.) Some shrubs and vines will grow rapidly when overwatered in early winter months, exposing tender new tissue to colder temperatures. This can make them more susceptible to frost and damage the plants. 4.) 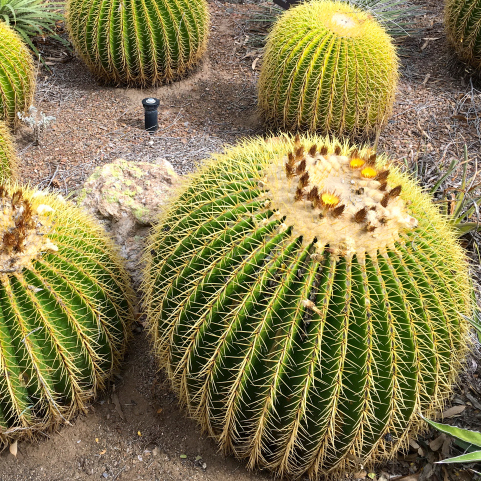 Cactus plants suffer less frost damage if they have not been watered for several months before cold temperatures set in. Cactus plants hold water in their cells. When the water freezes it expands and ruptures the cells, which can damage or kill the plants. 5.) Overwatering during the winter is more likely to produce pools of water in your lawn and around your plants that won’t evaporate as quickly as they would in summer. These puddles mixed with mild winter temperatures can breed mosquitoes. If you seem to have more of the pests around your patio and yard, check your irrigation schedule – you may want to let your yard dry out. During the winter, water also can pool near a home or building’s foundation, which can damage the foundation and invite pests, including termites. 6.) Most of your cities have water efficiency professionals with the right tools who can help business owners, apartment or facilities managers, and HOA board members determine precisely how much water a particular landscape needs to thrive. If you want to lower your water bill, give your city’s water efficiency professional a call and ask for help. 7.) It’s the time of year when your winter rye grass is established. That means your grass no longer needs the same amount of water as it did when you were germinating rye grass from seed. The sprinklers only need to come on once every seven to 10 days. You can cut back watering to once every two weeks in December and January. Established rye grass needs to be watered to a depth of 4 to 6 inches. Use a small wood stake or a screwdriver to check how deep the water has sunk into the yard. 8.) It’s not wise to assume your landscaper understands how to water desert-adapted plants and trees throughout the year without your direction. Let your landscaper know saving water is just as important as having the yard visually appealing. You can also take matters into your hands and learn how to manage your own irrigation controller. Most controller manufacturers have how-to videos on YouTube as well as toll free help lines. Check with your city. Some offer free classes or videos about how to operate your irrigation controller. 9.) It’s possible you are overwatering parts of your yard and don’t know it. While the weather is cool, occasionally turn on your irrigation system to find and fix leaks you may not see if you are irrigating during the night. When temperatures remain above freezing, night is the best time to water because less water evaporates. 10.) Trees should be watered deeply but far less often in winter. Native Palo Verde, mesquite and acacias only need a good soaking once a month. Other trees should only be watered once every two to four weeks. If you need more details about watering a desert landscape you’ll find them at Water - Use It Wisely Landscape Watering Guide. It’s worth the effort because homeowners use up to 50 percent to 70 percent of their water outside. That’s why your city’s water department offers free classes, free videos, free brochures and free professional consultations to help you save water and enjoy a thriving landscape all year. Find out more at amwua.org/landscape. Winter is the best time of year in the Phoenix Metro area and the best time of year to save water.